Some examples of ferrous metals would be mild steel, cast iron, high strength steel, and tool steels. Examples of non-ferrous metals would be copper, aluminum, magnesium, titanium, etc. The following text is taken from the Structural Manual For Ironworkers Manual V-Volume I. Blast furnaces require many auxiliary facilities to support their operations. However, in simplest terms, the furnace itself is a huge steel shell almost cylindrical in shape and lined with heat-resistant brick. Once started, or "blown-in," the furnace operates continuously until the refractory lining needs renewal or until demand for iron drops to the point where the furnace is closed down. The duration of furnace operations from start to finish is referred to as a "campaign" and may last several years. Ash from the coke is absorbed by the slag. Some silica in the ore is reduced to silicon and dissolves in the iron as does some carbon in the coke. At the bottom of the furnace where temperatures rise well over 3000 Fahrenheit, molten slag floats on a pool of molten iron which is four or five feet deep. Because the slag floats on top of the iron it is possible to drain it off through a slag notch in the furnace. The molten iron is released from the hearth of the furnace through a tap hole. 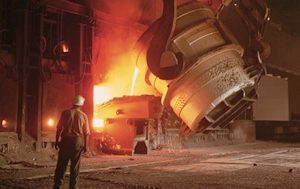 The tapping of iron and slag is the major factor permitting additional materials to be charged at the furnace top. This brief summary of the complex operations of a blast furnace is presented here to provide a point of reference for the actual flow of operations. Very often, several blast furnaces may be arranged in a single plant so that the most efficient possible use can be made of fuels, internal rail facilities, etc.